Have you ever played against an opposing team that took you out of your game? Did you rebound and re-focus on your game plan or did you spiral downward unable to regain control of your team’s style of hockey? Hockey is a fast-moving sport that requires composure and focus to be successful. Your opponents will attempt to draw you out of your game and dictate the style of the game. If you can’t regain your focus, you will lose control of the game. Both teams play different styles. Boston is a bigger more physical team that tries to take their opponents out of their game by playing aggressively. Montreal is quick and applies a lot of puck pressure. Both teams finished off their first round playoff opponents quickly. Montreal swept the Tampa Bay Lightning while Boston beat the Detroit Red Wings four games to one. So who will win this series? The team that sticks to their game plan and control the style of hockey. Throughout the season, Boston taunted opponents and attempted to disrupt their game drawing them into skirmishes. Pacioretty said the key for victory will be remaining calm and playing a disciplined game, “They’re a big team. They like to play really physical,” he said. Montreal won Game One, 4-3 in double overtime by sticking to their game plan and playing a disciplined style of hockey. In Game One, Montreal was whistled for only three penalties (holding, interference and unsportsmanlike). Game 2 was a different story as the Canadiens were whistled for six penalties including two unsportsmanlike conducts and lost to the Bruins, 5-3. Of course, you want to focus on your game plan but the most critical mental skill is to be able to recognize when you have been taken out of your style of play and quickly re-focus on your game. You must know what your strengths are and work your game plan according. When you play your style of hockey, you have a better sense of control and confidence. You must recognize when you have stepped outside of your style of play and quickly re-focus on your game plan. Coaches often call timeouts to get the players to relax and focus on the strengths of the team. You can take a mental time-out between shifts to accomplish the same thing. Take a deep breath and remind yourself of the game plan instead of focusing on what the other team is doing. 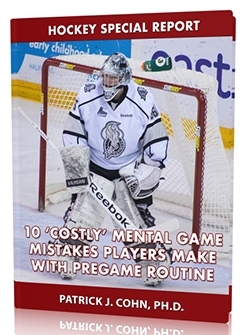 Quickly getting back on track mentally is the hallmark of elite hockey players.